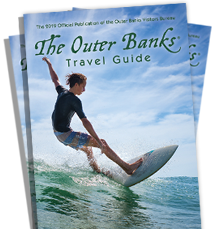 Experience the Outer Banks’ most exciting air tours. Soar over the Outer Banks in a 1942 open cockpit bi-plane (max 2 passengers) or in a Cessna 172 (max 3 passengers). Tours range from 5-8 minutes to an hour in duration. Do not miss seeing the barrier islands from your seat in the sky! View dolphins, sea turtles, shipwrecks, the Wright Brothers Memorial, Bodie Island Lighthouse and other popular attractions from a new perspective! See more in 30 minutes from the air than you can see all week on the ground. Air tours depart from Barrier Island Aviation, located just past the North Carolina Aquarium at the Dare County Regional Airport in Manteo. Call and reserve a flight today!